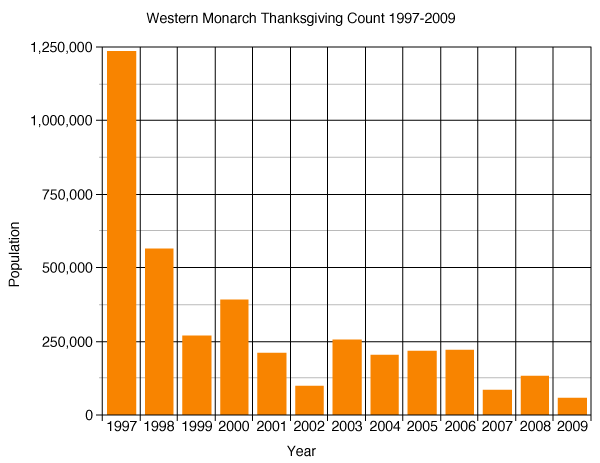 The eastern monarch population appears to be declining. The factors contributing to this decline are many. 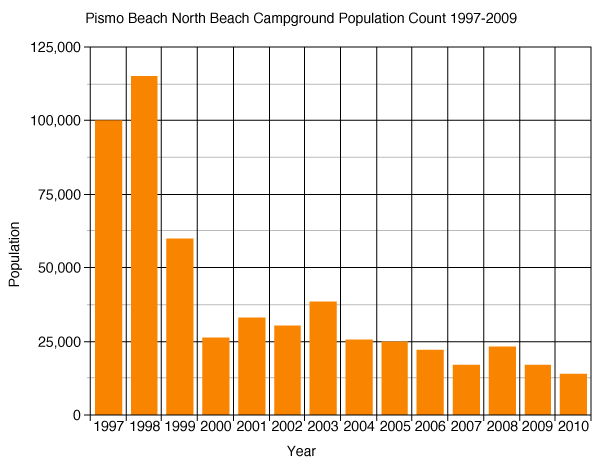 The three lowest overwintering populations on record have been recorded in the last 10 years. This includes the all-time low of 0.67 hectares recorded last winter. Three times (2002, 2004, 2010) in the last decade massive Pacific weather systems have moved into central Mexico in January and February. Each of these events resulted in heavy rain, often accompanied by hail, high winds, or freezing temperatures that devastated the monarch overwintering populations (for details see Status of the Population accounts in the Monarch Watch Blog). Mortality from these events ranged from 50 % (2010) to 80% (2002). Winter is the dry season in central Mexico and storms of this severity are an unusal and recent development. Illegal logging and a recent outbreak of bark beetles*, continue to erode the integrity of the oyamel forests in which the monarchs overwinter. Many lines of research by Lincoln Brower and his colleagues have demonstrated the importance of maintaining the integrity of the forest canopy for successful overwintering by monarchs. Loss of habitat in the summer breeding grounds is another factor that could be contributing to the decline in monarch numbers. We are losing 6,000 acres of potential monarch/pollinator habitat a day in the United Stated due to development (2.2 million acres per year). The losses of habitat due the adoption of glyphosate tolerant corn and soybeans in the last 10 years amount to at least 100 million acres. The conversion of 7 million acres of Conservation Reserve Program (CRP) land to crops for the production of biofuels adds to the total. 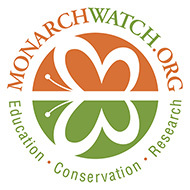 In all, we estimate the loss of habitat to be 147 million acres since Monarch Watch was started in 1992 – an area 4 times the state of Illinois. There is no doubt that our landscapes are becoming more fragmented and that there is less and less habitat for monarchs, pollinators and the wildlife that share the same habitat. This trend will surely continue…unless we step up and do something about it. *Bark beetle outbreaks have been attributed to climate change in many forests in North America. 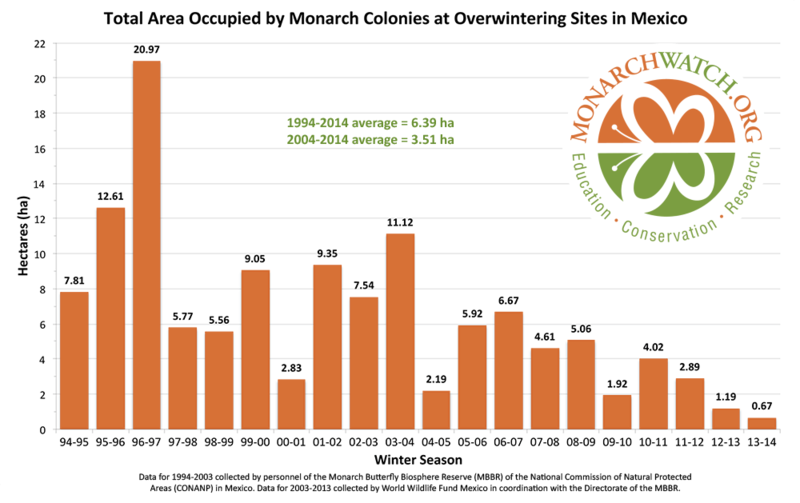 The numbers of monarchs recorded at the overwintering sites in California have been declining for more than a decade (see Western Monarchs posts on the Monarch Watch Blog). The numbers reported for the winter of 2009/2010 were the lowest on record. Loss of monarchs and milkweed due to roadside management practices, intensive agriculture and the extensive use of herbicides is certainly a factor in this decline. Sustaining the western monarch population will require extensive restoration of milkweeds as well as efforts to protect existing monarch habitats. Milkweeds belong to the genus Asclepias, one of the most diverse of all plant genera in North America with 108 species. Of these, 73 species are native to the United States. All are perennials with some having relatively short lives e.g., A. incarnata (swamp milkweed) which typically lives 3-5 years to A. meadii (Mead’s milkweed) which may live 100 years or more. However, the life spans of most species are not known. Milkweeds are generally open area species. A few seem to prefer the edges of wood lots or forests and an even smaller number live within moderately dense woodlands. Most species have specialized habitats even within open areas with some requiring well drained soils while others appear to need or at least tolerate saturated soils. Others tend to live on ridge-tops or need certain soil types. A number of species are so restricted to specific habitats that they are only rarely found away from such locations. Due to these specialized requirements and long life histories, many of the milkweeds have low replacement rates. That is, they may produce seeds for many years, maybe even 10s of years, before a new plant is established from a seed. In extreme cases, the life histories of the long lived species is not unlike that of many trees. Most milkweed species are so specialized they are not particularly good colonizers. In other words, in spite of having wind blown seeds, new seedlings usually do not become established unless the conditions are favorable for that species. What this means is that most prairie species do not colonize disturbed areas adjacent to the prairies and woodland species do not move into roadsides or fields. We should be thankful for the milkweeds that are good colonizers because it is these species that support the most monarchs due to their range of habitats and abundance. There are about 30 such species, and we are going to focus on the restoration of 19 species (see Milkweed Regions) that are the easiest to propagate and serve as good host plants for monarchs. Being a good colonizer does not necessarily mean that a plant species is a good competitor for light, space and nutrients. In fact, A. syriaca (common milkweed), by far the best colonizer among our milkweeds, tends to be out-competed and disappear as plant succession progresses. Maintaining this species, and several others, requires resetting of the successional stage – a fancy way of saying that to keep these milkweeds from disappearing, one has to adopt a mowing, burning or disking schedule that keeps the plot in an early stage of succession. Most milkweeds can be grown from seed and seedlings can be established under greenhouse conditions or even at your house. Procedures for germinating milkweed seeds often require stratification or vernalization (see Growing Milkweeds on the Monarch Watch site) and in some cases scarification. Since the conditions for germination and establishment in the field are often specific and not known, it is more effective to use plugs (one year old plants) for restoration rather than scattering seeds on prepared ground. For this reason, we are encouraging the use of plugs in addition to adding milkweed seeds to restoration mixtures. None of the milkweeds are invasive in the sense that the word “invasive” is applied to invasive species. Invasive species pose a threat to native vegetation since they tend to crowd out or displace native species. A few milkweed species are able to colonize disturbed sites, such as syriaca, sullivantii, and to a lesser extent tuberosa, asperula, viridis and verticillata. Species that form clones such as syriaca, sullivantii and verticillata can spread through rhizomes and, when used in gardens, can produce ramets (stems) where they aren’t wanted. Some people find this aggressive trait annoying, but it produces good stands of milkweed with little effort. Ramets showing up in places where they aren’t wanted can be transplanted or simply pulled up. Most milkweed species are self-incompatible, meaning that they will not set seed if the stigma receives pollinia from another flower on the same plant. Rather, pollinia have to be received from unrelated plants. A. incarnata (swamp milkweed) is an exception. This species appears to be self-compatible and genetically less variable than other milkweeds. Milkweeds are pollinated by wasps, large bees, and on rare occasions by butterflies and moths. One of our long-range plans is to establish plantings of milkweed under managed conditions for the large-scale production of seed to be used for the restoration. The requirement for outcrossing may necessitate the introduction of pollinators at such seed production operations. Most milkweeds contain compounds bitter to the taste that serve to deter herbivores. Indeed, most grazing animals will not eat milkweeds. The bitter compounds, known as cardiac glycosides or cardenolides, are vertebrate heart toxins. Acquisition of these compounds as the larvae feed on milkweeds serves monarchs well by giving them a measure of protection from predators. However, the extreme toxicity of a few milkweed species has resulted in the deaths of grazing, or even hay fed, livestock (horses, cows, sheep), particularly in the West, with the result that all species in the genus Asclepias have been branded as toxic and undesirable plants. This characterization is unfortunate, as is the use of weed appended to the names of each of the species in this group. The facts are that most of the cases of live stock poisoning have been attributed to two species, A. labriformis (labriform milkweed) and A. subverticillata (western whorled milkweed). These species are not recommended for either seed collecting or restoration. Two less toxic species, which have occasionally been implicated in poisonings, are A. eriocarpa (woollypod milkweed) and A. fascicularis Mexican whorled/narrowleaf milkweed). Both of these species have been incorporated into butterfly gardens in California and are candidates for restoration but only in areas where that are not likely to be visited by grazing animals. Seed mixes are used to restore habitats for wildlife (quail and pheasants), restoration of native vegetation, to reseed construction sites, and rights of way along state and federal highways. Milkweed seeds are seldom included in these mixes. Our aim is to change this situation through the nationwide milkweed seed collecting and production program. By adding milkweed seeds to these mixes we hope to get milkweed reestablished in areas from which it has been extirpated and to introduce milkweeds into sites to be re-vegetated. Establishing native plants with the use of seed mixes can be difficult and the rate of successful establishment for many species is often low. To improve the odds for milkweeds, direct planting of young plants (plugs) is more successful, provided it is done with care and at a time when precipitation is likely to occur in the weeks following planting. To produce plugs we will contract with regional nurseries to germinate and grow out milkweed seedlings that can be used for this manner of restoration. Some of these plugs will be available for plant fundraisers as described below. Numerous procedures are used to restore prairies and native vegetation for wildlife depending on the region of the country, the soil types, rainfall patterns and whether the plot already is covered with vegetation. If vegetation is already present, treatment with herbicide at the right season followed by mowing and a light tilling of the surface is usually required before seed can be added. Once the soil is prepared, the seed can either be scattered by hand or a seed drill can be used. As this project proceeds, we will develop a set of restoration guidelines for milkweeds. In the meantime, we suggest that you consult with county agents or your local native plant societies for the best restoration practices for your area. Several commercial nurseries specializing in seeds of native plants have excellent online directions on how to restore native species. Areas restored to native vegetation require different degrees of maintenance depend on the region of the country. In much of the NE region, areas that contain milkweeds and nectar sources are invaded by shrubs and trees. Mowing at the end of the growing season, once every two to three years, is usually needed to control these invading species. Selective use of herbicides may also be necessary depending on the nature of the invading species. 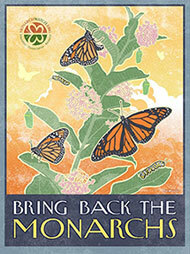 At Monarch Watch we raise money in a variety of ways. One of our more successful ventures each year is our annual Spring Plant Fundraiser and Open House. This 7 hour event typically attracts 500-700 people. We specialize in milkweeds and nectar plants and many of our visitors come from great distances because they know we have plants for their butterfly gardens that are difficult to find elsewhere. The plants are available for suggested donations and most of the 4000 plants we raise for this event are gone by the end of the day. We have the use of a greenhouse and this helps greatly. We buy plugs from nurseries and transplant these to larger pots 3-8 weeks before the event. Most of the nectar plants are quite lush or even flowering at the time of the fundraiser. My reason for mentioning the fundraiser is that I would like to export this model to your organization for the purpose of helping you raise money but also to further the distribution of regionally appropriate milkweeds that could be used in gardens and landscapes in your area. Here is how it would work: If you have the use of a greenhouse, order the plugs for the milkweed and nectar plants to arrive about 4-6 weeks before your event. Recruit volunteers to transplant the plugs into larger pots, 2.5, 3, or 4 inches square at the top, fertilize and water them as needed and add labels (tags) for each species. Advertise the sale and your cause with an emphasis on the value of adding milkweeds and nectar plants to gardens and landscapes to support monarchs and pollinators. If you get the right publicity, you will need some volunteers to help sell the plants. Your organization would make money from this venture by ordering the plants wholesale through Monarch Watch and we will have the plants shipped to you from the nurseries we work with. (We will be contracting with nurseries to get them to grow milkweeds for each region.) Most wholesale plugs cost $0.75 to $1.50 each and the transplanted and partially grown plugs can sell for $4.00 or more. If your organization does not have access to a greenhouse, you can order the plugs so that they arrive the week of the sale or maybe 10 days earlier. The plants can be placed in a well-lit and protected place and grown out a bit before the sale. Again, you can advertise your cause and that of the monarch and still raise funds by selling the plugs for $2-3.00 each. If you already have plant fundraisers, you have an idea of the number of people you attract and the number of plants to order. If you haven’t done this previously, start with a few hundred plugs of a variety of species. Having pictures of each plant in flower helps with the sales. If your organization is interested in raising money through a plant fundraiser, and you would like to discuss this idea further, please give us a call.